gastronommy.com: Beans, beans, they TASTE like fart? Beans, beans, they TASTE like fart? As some of you know, I am now based in Singapore and have taken on a new job as a writer for a food magazine here (more on that in a later entry). For an assignment that you will see published in the September issue, a few weeks ago I had to take on a Malay tour with one local and one expat chef. I’m not exactly all-knowledgeable when it comes to Malay cuisine, but there’s no way anything could have surprised me. Or so I thought. To put it elegantly, they taste GNARLY. When you first bite into them, it tastes and feels something reminiscent of a lima bean. Then as you chew through, it begins to start emitting a certain pungency. It's not exactly distasteful since it reminds me of raw garlic at this point. By then, you think that's going to be all there is to it. But no, as you come around to finish chewing through the single bean, it suddenly spikes up with a grimace-worthy level of bitterness. And upon swallowing, it disappeared into the depths of my stomach with a grand finale: I have never known the experience of tasting fart in your mouth until now. And it will leave a very very very long lingering aftertaste of exactly that too. That experience, my friends, was only after a SINGLE cooked petai bean. Yet, they're strangely addicting. I have yet to have the courage to take sambal petai by entire spoonfuls, but I do like the initial pungency and texture. 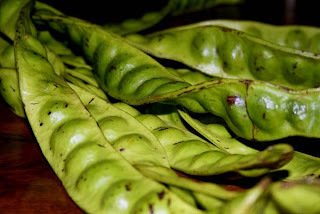 I've discovered today through knowledgeable local food writer Christopher Tan, that petai beans supposedly have many health benefits and are found in Thai cuisine too (strange that I've never eaten it before, as I have family in Bangkok and visit often). Beans, beans, they make you fart. Three cheers for new discoveries and funny tasting beans! See the story on the Malay and petai bean experience in the upcoming September issue of Appetite magazine. *photo source unknown. Please contact me if you are the owner of this photo. My family loves those. I ... can't. And how apropos - the captcha is "prapp." Not good for your digestion me thinks . . .